As 2011 comes to a close, we can safely say that social media has become the norm rather than the exception, since Facebook has more than 10% of the world’s population (800 million out of 7 billion) using its site. Even broadcast TV puts twitter hashtags in their show’s title overlays. Because there are nearly as many social media outlets as there are social media users, implementing an effective strategy can be overwhelming. However, a few fundamental principles can help you keep your aim squarely on your marketing and business goals. Join me for this 101-level webinar on how to encourage people to go where you want to take them…back to your CU’s web site. We’ve got a new innovation to help you out in your endeavors… our new Knowledge Warehouse. We have placed all of the online video tutorials that I’ve shared with you on the discussion in the Knowledge Warehouse, ready for you to view instantly, at any time. All of the videos pertaining to EverythingCU are absolutely free of charge. There is even a new video there called “Under the Hood of EverythingCU” which covers some discussion navigation techniques you might not be familiar with. Once you purchase a video, anyone at your credit union can also access it, and you can watch it at any time since there will be a link to it on your personal profile page. In addition, I am working on creating a new set of online video tutorials for the Knowledge Warehouse, and these will cover many aspects of social media marketing, including Facebook, Twitter, and LinkedIn tips. Others areas I can cover, if there is interest, include blogging, podcasting, and videocasting. These instructional videos will be available for a nominal charge, and you’ll be able to watch them instantly on your computer screen as well. If there are any aspects of social media you specifically want me to cover, please shoot me an email at any time. I’ve been involved in this field since 2005 (or since 2000 if you count EverythingCU as a form of social media), and I’d love to share my knowledge for the benefit of you marvelous EverythingCU’ers. Check out the new EverythingCU Knowledge Warehouse here! Enjoy! Based on the conversation exploding on EverythingCU.com over the past two days on Credit Unions and the ROI of Social Media, I created and edited this opinion piece down to 10 minutes to fit it onto YouTube. I talk about branding, marketing, social media, credit unions, ROI, the future of credit unions, their Boards of Directors, and their members, and my mom. I think what we currently think of as Social Media (aka Online Community Engagement) has the potential to transform it all. What do you think? Hi, I’m Morriss Partee, Chief Experience Officer of EverythingCU, and I’d like to make this quick little video blog on a topic that is near and dear to my heart, and that is credit unions and social media. It’s been an amazing thrill to see the topic of credit union’s use of Social Media and its ROI really blossom on EverythingCU in the past couple of days. I’ve watched with great interest as many opinions have been stated very forcefully from both sides. There are a lot of good arguments, both for and against, credit unions using social media. Social media, and if we use the term to mean online community interaction, is, without question, transforming the way that people across the United States, and even across the world, are interacting with each other, and interacting with the world [around them]. So this social media phenomenon and revolution has affected or will affect virtually every department of credit union operations. It’s clear there are marketing implications and operational implications. But I’d like to talk about one are which I think in the long run, has the largest potential to truly improve credit union business and the way members interact with and view their credit union. One of the big sea-changes in the way that credit unions operate with their members is when credit unions were deregulated from standard fields of membership in 1998. And since that time, credit union after credit union after credit union has gone to community charter, or a charter much broader than their original one. As example, my mother is a member of UMassFive College Federal Credit Union. Whenever I’ve had the pleasure of working on marketing campaigns for that credit union, I often think of my mother as the ideal target market. And every now and then, I’ll ask her a question about the credit union. “How do you feel about this? Why do you do business with the credit union? What do you like about it? What don’t you like about it?” And the thing that really strikes me is that because my mother is a retired professor from UMass, she feels like UMass Federal Credit Union is HER credit union. She knows the people who run it, she knows that the people who are members are colleagues of hers, that are affiliated with UMass in one way or another. Of course, she’s very proud of UMass. So anyway, that’s the world in which credit unions have traditionally operated. But for any credit union that is now far more broader than an original employee group, or their employer has changed, merged, been outsourced overseas, their original SEG has shut down, gone out of business, merged, diversified, whatever the story is, those credit unions need a new reason for being. Something that is fundamental, that makes you feel like “this is MY credit union.” Well, what do credit unions talk about in terms of the difference [between themselves and banks]? The difference is in their governance, their form of governance. Credit unions are not-for-profit cooperatives. This is supposed to be MY credit union. Well, what does that mean, “MY credit union”? Does that mean I can withdraw a million dollars? Well, no, of course not, it doesn’t mean that. Well, then what does “MY credit union” really mean? How can we replicate, how can we make people, feel, understand what “MY credit union” means? We are the members, right? We are the member-owners. That’s the fundamental thing we’ve got going here. So what does it really mean to be a member-owner? Well, right now, because of previous technological or operational limitations, membership really has only meant that I vote for a Board of Directors once a year. And I’m only voting for 3 out of 9 or so [board] members each year. And unless I’m really well-tied into the community or connected to the community, I have no idea who these people are. I might get one paragraph and a little, tiny one-inch photograph of what the person looks like, and they all kind of say the same thing about how they’re going to make sure the credit union is operated in the best interest of its members. Great. Well, it doesn’t help me choose, it doesn’t help me understand [who these people are]. I feel relatively powerless, and it doesn’t make me feel much like it’s mine–that I get to vote on… I don’t know who. She actually stopped blogging after a couple of years. I think it’s simply because she was way too far ahead of her time, and perhaps people in the Plattsburgh region weren’t really ready for a local credit union to blog, and to understand what that meant, and to know how to find it, and know how to interact, or to want to interact. But I still feel like, as people now come online in different ways, Facebook, Twitter, email , blogging, what have you, I feel that there are new opportunties for credit unions to really make a difference with their governance. Online input on CU governance! So anyway, that’s just my thoughts, rambling from here in Western Massachusetts on a dark and stormy, rainy December night. I would love to hear your feedback on whether this aspect of inviting membership into governance has significant potential to truly revolutionize how credit unions market with and do business with their members. 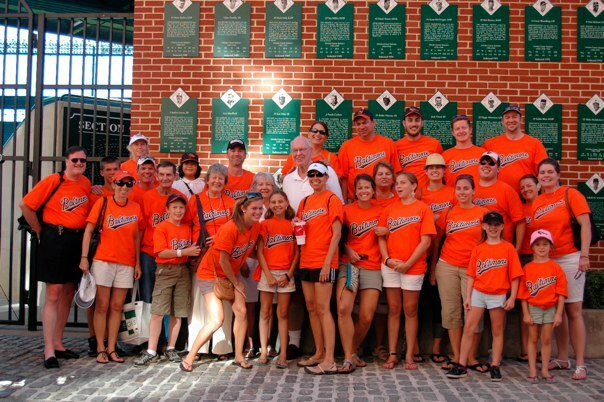 This past weekend, I travelled with my family down to Baltimore for a reunion, including catching a ballgame at Camden Yards. While we were there, we stayed at the Crowne Plaza hotel in Timonium, MD. I’ve been using geolocation service Gowalla since Baer Tierkel turned me on to it in November of last year (2009). So upon arrival at the hotel, I opened the Gowalla app on my iPhone to check in. I immediately noticed that instead of a generic hotel icon, the Crowne Plaza had its own snazzy custom icon. Since I was busy with a family reunion, I didn’t have time to investigate this meaning behind this tweet until I returned home. So this morning, I visited the Topguest site, and noticed they had a Facebook page, which is good since there is very little about them on their own site. Via their Facebook page, I discovered this is a very new (4 month old) start-up based out of NYC. They have 4 hotel reward programs under their belt, and they accept check-ins from all the major geolocation services: Brightkite, Foursquare, Gowalla, Facebook Places, and Twitter location. Topguest ties your geolocation check-in method(s) of choice to your hotel reward program(s) of choice. Since I love Gowalla and am already a Priority Club member, it was a snap for me to link the two. Priority Club encompasses the InterContinental Hotels Group (ICHG) which includes: Holiday Inn, Holiday Inn Express, Crowne Plaza, Staybridge Suites, and another recent discovery I love: Hotel Indigo. It can be intimidating to try to hold a PodCamp, BarCamp, REBarCamp, BarCampBank, or any type of event for that matter. Just in case anyone who is thinking about holding a Camp is feeling intimidated by the prospect, or disheartened that the process might not be as smooth, let me offer a few words of encouragement, from someone who has attended REBarCamps, FacebookDevCamp, and has attended and organized both a BarCampBank and two PodCamps. There are so many people out there who NEED to have their first PodCamp experience. They will have their eyes opened to the fact that all this stuff happening on their laptop/smart phone represents REAL LIVING PEOPLE. They are not alone in the world. There are others who are going through the exact same experiences, who are ready, willing, and able to learn from others who are similar to them that live RIGHT in YOUR area. Don’t get hung up about attendance numbers. There is no right number. I’ve been to camps of all shapes and sizes, from 15 to 750. And let me tell you, I LOVE camps that are 35-60 people. There is an intimacy shared that you lose when it gets as large as 100 or 150 or more. I love the big ones too, but there is NOTHING wrong with small and intimate. This is a non-profit endeavor, right? No one has a profit motive to try to put on a huge PodCamp. Throw away the idea of a traditional conference with thousands of attendees, a huge stage, and breakouts only as time-filler. To me, the ideal model of PodCamp is to have ONLY breakouts; 4, 8, 12 or however many of them simultaneously, some as small as a conversation between two people, others with 12 people, others with 20, others 40, in an urban brick building converted into classroom spaces all around a central gathering space. 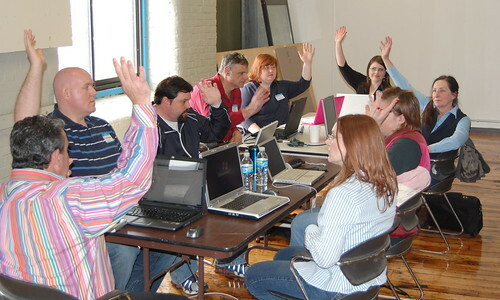 Another thing to keep in mind: the people who want to, and need to, learn from the PodCamp experience…. you don’t know who they are yet. They will come from being friends of attendees who hear about what an amazing thing PodCamp is. They will come from friends of current local social events who are beyond stoked about the prospect of your Camp. You can’t get that until you have Camp #1. Let the thing grow organically. That’s what happened for the original BarCamp and the first PodCamp Boston. What you want is a small, highly charged, well connected core of people, who blog, podcast, tweet, fb, and videocast their experience with your first Camp… what it meant to them, what they got out of it. Have a maximum attendance cap. It can be 100 people. Keeping it limited like that accomplishes many positive things at once. Don’t care if only 50-60 people show up to the first one. About 35 people pre-registered for PodCamp WesternMass 1, but we had about 50-55 people total show up. Attendees brought friends with them; there will always be people who show up at the door with admission in hand. The following year, when we did PCWM for the 2nd time, word had spread about what a great event it was, and we nearly doubled attendance. You have to create the first one. 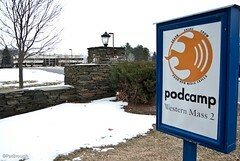 Since so many don’t know what a PodCamp or other Camp is (but awesome people DO know what it is), they aren’t going to get excited about it ahead of time. But adventurous people WILL check it out and attend. Trust it. Do it. The right thing will happen.